Breaking with tradition, this powerful engraving depicts the tortured Christ as vulnerable and afraid, recoiling as his tormentors scourge him. 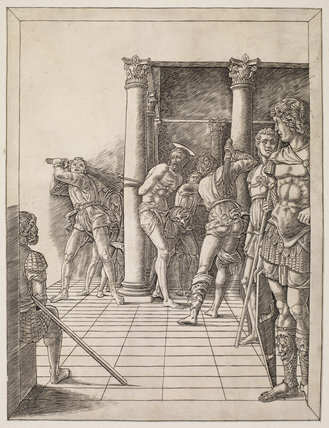 One of the first Italian artists to embrace printmaking, Mantegna was attracted by its potential for creating original compositions that disseminated his work to a wider audience. The sculptural quality of the bodies is achieved by modelling them with light and shade using a range of parallel lines. A preparatory drawing for the print also came to The Courtauld Gallery as part of the Princes Gate Bequest.